The Urban Energy of Cape Town is brought into stark focus with Charnell Timms Photography. 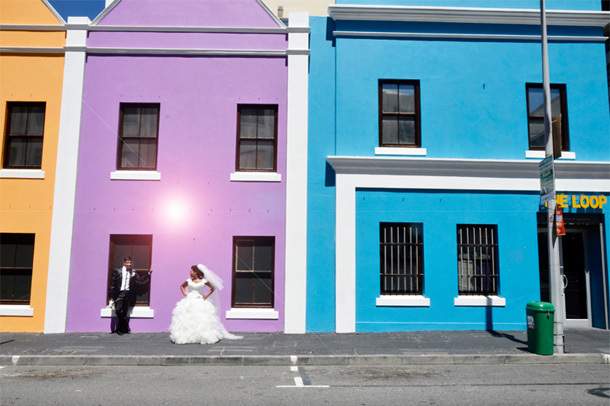 Charnell is a freelance photographer in Cape Town specializing in wedding photography and destination photography. Her Nikon’s have taken her around the globe where she has shot wedding from minus 20 degrees celsius in Minneapolis USA, to England, Germany, France, Ireland as well as true Island style on the beaches of Mexico. Charnell’s artwork can best be described as edgy, modern and trendy and she is one of the few photographers who have added to the uniqueness of her packages by shooting with the fisheye lens. She is also one of the few photographers who specializes in ‘Urban Energy’ wedding shoots. Centered around the heart of our city is Long street Cafe which offers a glimpse of our Victorian past with its impressive art-deco style. Elsewhere around the city, one is spoilt for choice with vibrant colours, trendy African textures and city-slick restaurants dotting the map and clothing my camera with the perfect cosmopolitan vibe. I love the freshness, the vibe and interactive nature that the city brings to wedding shoots, as well as friendly locals who love to cheer for wedding couples during these shoots. This adds a brilliant memory to the whole photography experience for the wedding couple. Charnell’s uniqueness does not end with the shoot, but with her interesting photography packages on offer. Her ‘photography puzzles’ are a delight and she shoots in both black and white and colour, but also offers photographic products in her self-styled muted tones which are commonly referred to as ‘Black + white-colour’.